Anns Hill Self-cateringAnns Hill is an extremely handsome Georgian House, 2 miles from the bustling market town of Cockermouth, William Wordsworth birthplace. Anns Hill Cottage is attached to the main house, has been lovingly restored and now provides superb accommodation for the discerning guest. No half measures, no short cuts, everything about the facilities, furnishings and decor are out of the top drawer, creature comforts abound in every room. If you are searching for somewhere special to spend a few days away from it all with someone you cherish, look no further, you've found Anns Hill. 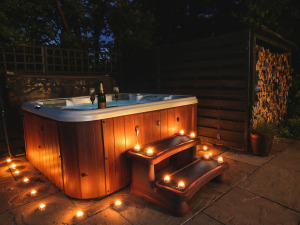 Private hot tub at Anns Hill Lodge- a perfect place to relax after a day on the mountains. Winner of the Trip Advisor, Exceptional Service Award 2015 - 5 star cottages with everything you need for a relaxing holiday. A breakfast basket delivered to your door each morning is complimentary and champagne is chilled for your arrival. Hot tub in lodge. Children welcome from any age. Continental breakfast included. 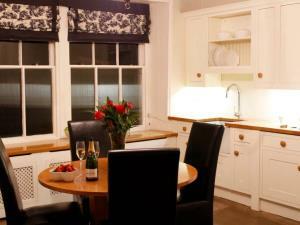 Superb fittings throughout, spacious with fabulous views. Super king-sized 6ft bed. Watch TV in the double slipper bath. Bose music system. A perfect romantic retreat. Meals and beauty treatments can be arranged, and a complimentary breakfast basket is delivered each morning. The property has a super king sized bed and bathroom with TV and a roll top bath big enough for two. A 50% deposit will be taken at the time of booking and the balance taken automatically 30 days prior to your arrival date. Continental breakfast, bathrobes, toiletries, flowers, linen, heating,electricity and champagne and chocolates all included in the price. From the south, leave M6 jct 40, A66 to Cockermouth. At second roundabout take A595 to Carlisle, straight across third roundabout, take first left which is signposted Bridekirk. Anns Hill is 400m on the left. From the north, leave M6 jct 44, A595 to Cockermouth. Take the second signpost to Bridekirk. This junction is just before you get to the Cockermouth roundabout. Anns Hill is 400m on the left.